We never want Customers to have a bad experience, and we'd hate to lose your business. If you're having issues, the chat button in the lower right-hand corner of the page goes to actual humans in the U.S. who are ready and trained to help. We want your feedback! If there's a reason you're canceling a paid plan, we would love it if you gave us a shot to address it. Like any small business, our customers are our livelihood and everyone who asks for help gets an answer. You can also email us at help@shopventory.com. NOTE: You must log in at least once every 30 days to keep the reports coming. We will stop pulling information if there are no logins for 30 days or more. 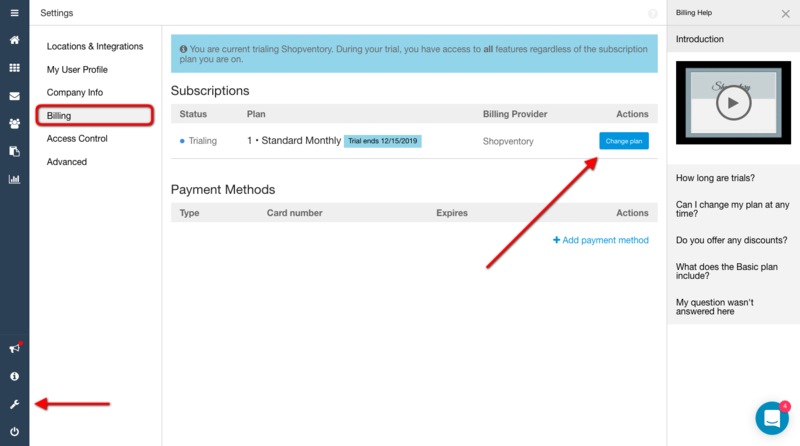 To quit a paid plan and move to Basic, you'll have to visit the Billing Info section of the Settings tab in your Shopventory account. Note: Deleting or uninstalling the Shopventory app from your device DOES NOT cancel your subscription. Simply click on the Change Plan button, then select the "Free Basic" option from the options panel to discontinue your paid plan. If you are unable to downgrade or unsure how, please contact us! You can upgrade again to a paid plan at any time. IMPORTANT: If you disconnect your POS integration from Shopventory, or request to have your account disabled, your inventory history will disappear and cannot be recovered. To remove Shopventory from your device, you'll have to visit your point of sale provider's app store or contact your point of sale provider to uninstall the Shopventory app. What's Included in the Free Basic Plan? Please let us know if you have any questions. We are here to help!